Financial Planning: Does Your Financial Plan Account for the Abundant Hopes and Dreams You Have for Your Child? Financial Planning provides strategies for paying for the goals you have created in your loved one’s Vision Plan. It also addresses the challenges of how to provide the necessary services and therapies determined by your Resource Plan. In my 10+ years of experience in the planning industry, I have found that families often delay Financial Planning—not because they view it as unimportant—but because they feel overwhelmed, frustrated, and confused by the process. They are overwhelmed by the number of decisions that they know they need to make. These families soon become frustrated and confused because they don’t understand which strategies would best benefit their family’s unique situation. You know Financial Planning is essential. With the right team of experienced advisors to guide you, your Financial Planning process can be easy, efficient, and affordable, allowing you to create a customized plan that prepares your family for the future, including the future of your child with special needs. However, Financial Planning is FOURTH on my list of Special Needs Planning areas because this process is what funds the Vision, Life, and Resource Plans. Without these other three plans, your Financial Planning process will lack direction and intentionality. 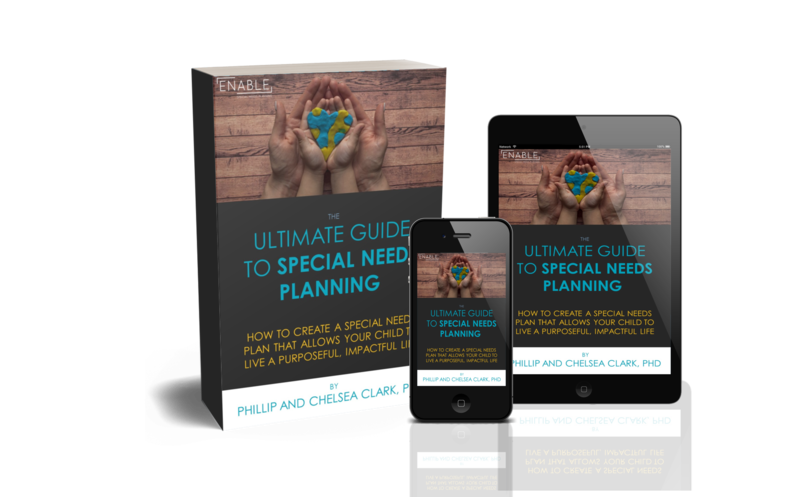 Completing these first three areas of Special Needs Planning before you create a Financial Plan will give your family motivation to continue planning. Like I tell everyone I speak with, when you have a strong enough “WHY” for planning, the “HOW” becomes much easier. Like other areas of Financial Planning (e.g., retirement, college, long term health care), every individual has unique goals and needs. It is important to have a conversation with a professional who will be able to ask questions to help you uncover your family’s unique intentions, opportunities, and challenges. By understanding your uniqueness—together—you and your financial professional will be able to develop meaningful strategies to help your family achieve financial success. Life rewards action. While your thoughts, hopes, and intentions are useful, without action, you’ll never complete your plan. I encourage you to reach out to a trusted advisor TODAY to begin having a conversation about planning financially for your family and loved one with special needs. Now that you’re familiar with a Financial Plan and understand why this area of planning is essential, you’re ready to learn about the next step of the planning process: Creating a Legal Plan. Don’t miss the next post of this series: Day 6: Legal Planning: Are You Prepared for The Future? Age 18 and Beyond… where I’ll explain the ins and outs of Legal Planning, including why you definitely don’t want to skip this part of the planning process! Look for that post tomorrow around 2pm ET on my website (www.enablesnp.com/blog) or Facebook page (@ENABLEsnp)! Previous postResource Planning: Does Your Child have Access to All the Resources They Need to Thrive? How Would You Know?